The government’s forces, too, have been accused of making crossings difficult. At the other end of eastern Ghouta, a second exit corridor was opened on Thursday from an area controlled by a different rebel group, Faylaq al-Rahman. There, a family of five was killed on Friday in a government airstrike as they tried to reach the crossing, said Ahmed Hamdan, an anti-government activist in the area. But some residents said the family had been killed in an “ordinary” airstrike, not while trying to cross. Protests erupted on Friday in the town of Kafr Batna, also controlled by Faylaq al-Rahman. A resident there confirmed the authenticity of footage shown on Syrian state television of residents asking the group to leave so that the government would stop bombing. The government has rejected most requests to deliver humanitarian aid, and this week’s convoy to Douma, the largest city in eastern Ghouta, was the first since November. But medical supplies were removed by the government before the convoy set out and government airstrikes forced it to retreat before the last 14 of its 46 trucks could be unloaded. The strikes began well before the end of the five-hour daily cease-fire window that Russia, the Syrian government’s main ally, has promised. On Friday, government shelling again interrupted a delivery attempt, when the remaining 14 trucks made their way into Douma. That forced United Nations officials and workers on the convoy to hide in basements, said observers in Douma with the Violations Documentation Center, a Syrian organization that tracks the conflict. The United Nations humanitarian coordinator in Damascus, Ali al-Za’tari, noted that the shelling near Douma had erupted despite assurances of safety from Russia, and was putting members of the convoy at risk — workers with the United Nations and with the International Committee of the Red Cross, and volunteers with the Syrian Arab Red Crescent. 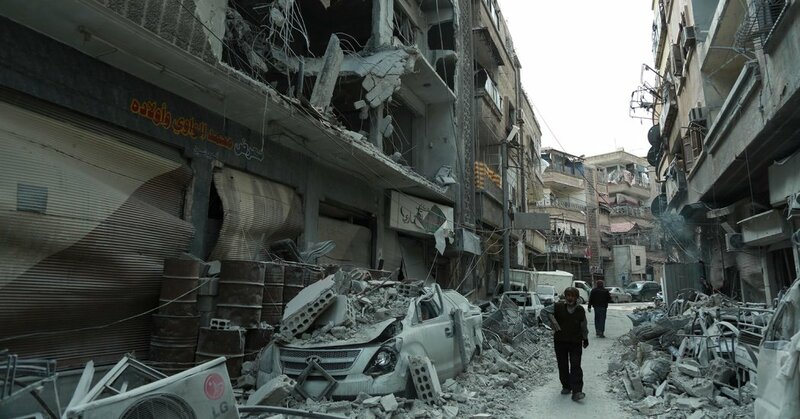 The situation recalled an incident in 2014 when United Nations officials were shelled by pro-government forces as they tried to make a delivery in the old city of Homs, then held by rebels.